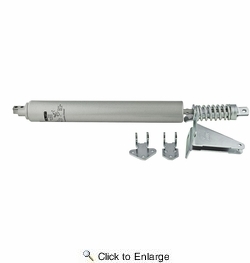 National N184-770 Shock-Absorbing Door Closer - Aluminum. Heavy duty storm and solid door closer designed for use in out swing wood or metal doors up to 1-3/4 inch thick. Torsion bar and large air controlled 1-1/2 inch tube combine to provide twice the latching power of a standard duty closer. Fully adjustable door closing speed and permanently lubricated to extend operating life. Supplied with handy "hold-open" washer.